This emphasizes the high involvment of scientists into the evaluation process for increasing the quality of science. It also acknowledges the high curiosity and the altruistic qualities that are required for a peer-review process of quality. On Publons.com website, the award is described as follows. “The top 1% of reviewers in each of the 22 Essential Science Indicators (ESI) research fields. 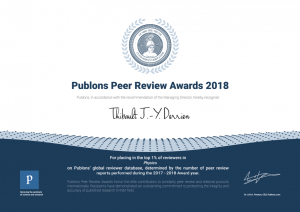 Rankings are calculated by number of verified pre-publication reviews performed and added to Publons between 1 September 2017 and 1 September 2018. Reviews were attributed to a ESI field based on the journal the review was performed for. We added a 23rd field, “Assorted”, to celebrate reviewers whose contributions were for the small amount of journals on Publons could not be directly matched to an ESI field.